How a .pdf document is printed from the HR/Payroll sections of the EBS Portal depends on which browser is being used. Adobe Reader is the supported .pdf viewer on Microsoft Internet Explorer and Mac Safari. Other browsers such as Mozilla Firefox ESR and Google Chrome have their own .pdf viewers. Directions are given for each below. From the page where you find the desired pdf, click the Adobe .pdf icon of "Generate PDF" button. It will open in a new tab or window. If it does not do this, see your technical support about the pop-up blocker on the machine you are using. Internet Explorer should be set to use Adobe Reader as the .pdf viewer. Hover over the bottom of the screen, and this toolbar will appear. Alternatively, the F8 key on the keyboard shows the Adobe Toolbar at the top of the document window. In Microsoft Edge, clicking on the document will open a toolbar. The print icon is at the top right of the screen. Some applications, however, like the Time Statment and Benefits Statement will not show this option. For these applications, right-mouse click on the item, and choose "Save as." After saving it, you can open the document and print it in Adobe Acrobat Reader. 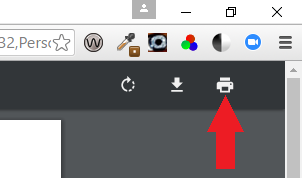 Hovering over the document near the top right corner makes the toolbar appear, containing the print icon. Mac Safari, if set for Adobe Reader, works much like Internet Explorer above. 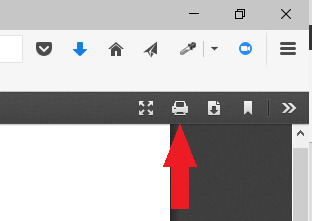 You may need to click an icon at the bottom to open the document in a new Adobe Reader window in order to print it.